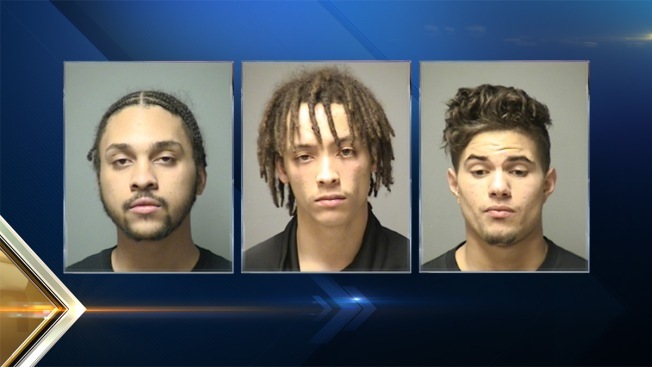 From left, Tyvon Watson, Patrick Simms and Josiah Brown were arrested following a large fight in Manchester, New Hampshire, over the weekend. Three people were arrested following a large fight over the weekend in Manchester, New Hampshire. Manchester Police said they responded to a report of a large fight on Laurel Street around 11:15 p.m. on Saturday. The caller said a gun might have been displayed during the incident. When police arrived, they saw several men running from the area and gave chase. Two men were apprehended a short distance away. Tyvon Watson, 19, of Manchester and Patrick Simms, 20, of Hooksett, were both charged with resisting arrest/detention and later released on personal recognizance bail. They are scheduled to appear in court on May 13. Missing Girl Likely Headed to Nashua, N.H.
A third individual, Josiah Brown, 18, of Auburn, was located sitting on the porch of another Laurel Street address. Police said he appeared to be drunk and was only wearing one flip flop, while holding onto a backpack. A second flip flop was located between the site of the reported fight and the porch. Police said Brown's clothing matched the description of the man who was allegedly waving a handgun during the fight. A handgun was located in his backpack. He was ultimately charged with resisting arrest/detention and carrying without a license. He was released on personal recognizance bail and is scheduled to appear in court on May 13.